Importance. 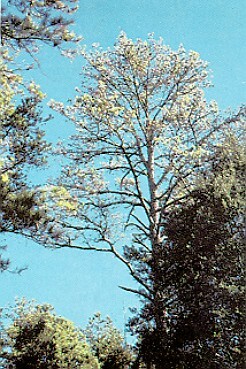 - Littleleaf disease is the most important disease affecting shortleaf pine in the South. Loblolly pine is also affected, but to a lesser degree. Affected trees often die within 6 years of first symptom expression. Identifying the Causal Agents. - This disease is caused by a complex of factors which include Phytophthora cinnamomi, heavy clay soil, and soil that is low in nitrogen. Also, Pythium spp. and nematodes often contribute to the damage. While the soil can be evaluated on site, laboratory analysis is required for confirmation of the fungi, nematodes, and nitrogen deficiency. Identifying the Injury. - While the damage is to the roots, the obvious symptoms are seen in the crown. The first symptom is needle yellowing. New needles are shorter and fewer in number. Eventually, the crown looks sparse and often has a tufted appearance. A heavy crop of small, very persistent cones normally develops 2 to 3 years prior to tree death. Often there is a flush of epicormic branches on the bole of the tree. Biology. - This disease occurs on trees growing on low quality sites-such as old fields. For various reasons, including nitrogen depletion, poor aeration, and rootlet competition, the rate of new rootlet formation by the tree declines and the rate of loss resulting from the killing action of P. cinnamomi increases. On poor sites, infected trees showing early symptoms are expected to survive about 6 years. On better sites they may persist 15 to 20 years. Control. - In the forest, losses can be minimized by salvage, favoring loblolly pine within its range, or, where silviculturally appropriate, converting to hardwood. In an urban or high value forest situation, a high nitrogen fertilizer can be used to delay mortality for as much as 6 to 12 years.